In Canada, wood pellets are made from material that would otherwise be wasted. This includes sawmill residues -- sawdust, planer shavings, and sometimes even a little bark -- and diseased and insect-killed trees and logging waste that sawmills have left behind in the forest after logging. In some regions, this also includes under-utilized species or tree segments that are not suited for other applications. Our industry turns this waste into clean, renewable, carbon-neutral solid biofuel. This section includes production and export details. As of 2012, Canada had 42 pellet plants with 3 million tonnes annual production capacity. In 2010, Canada's pellet plants operated at about 65% capacity - producing about 1.3 million tonnes per year, while in 2011 almost 1.9 million tonnes of production was exported. 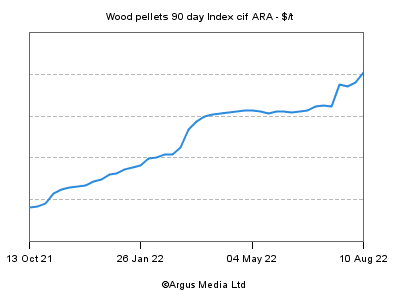 For up-to-date wood pellet export stats, click here. British Columbia accounts for about 65% of Canadian capacity and production, while Alberta, Quebec, New Brunswick, Nova Scotia, and Newfoundland collectively account for 35% (see a map showing pellet plant locations and volumes here). Pellet plants in BC tend to be large. An average BC plant produces about 150,000 tonnes annually. Two new BC plants are being built with annual capacity of 400,000 tonnes. Pellet plants in Eastern Canada tend to be much smaller, based on available fibre supply and different markets. Most have about 50,000 tonnes capacity; the two largest eastern plants produce 100,000 tonnes annually. Global wood pellet production has grown rapidly since year 2000, and is currently over 11 million tonnes per year, as seen in the table below taken from the report Lamers, P., M. Junginger, C. Hamelinck and A. Faaij (2012). "Developments in international solid biofuel trade – an analysis of volumes, policies, and market factors." Accepted for publication in Renewable & Sustainable Energy Reviews. DOI: 10.1016/j.rser.2012.02.027., and used here with permission from the authors. As seen in that same report, Canadian production continues to be exported overwhelmingly to Europe, with a diminishing supply going to the US, mostly for home heating. Canadian consumption has remained flat for the past decade, although there is increased discussion around using wood pellets as a substitute for coal in power generation.